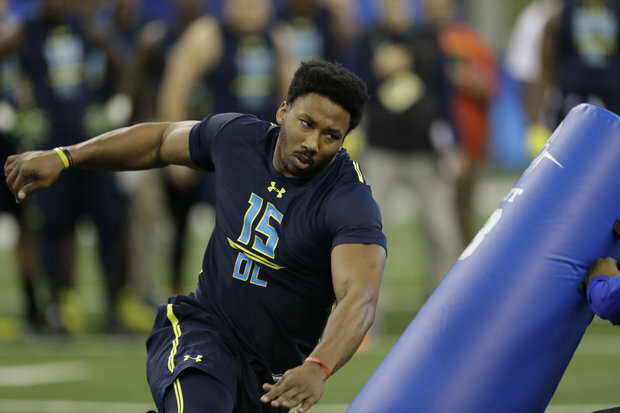 CLEVELAND, Ohio - Myles Garrett is making the Browns' decision easy with his stunning workout at the NFL Combine Sunday. Sources said the Browns were blown away by Garrett's Combine, both the interview and his off-the-charts workout, and that they're close to making him their No. 1 overall pick. "Myles Garrett is having one of the most amazing Combines for a defensive lineman I can remember,'' tweeted Matt Miller of nfldraftscout.com. "Garrett basically not giving the Browns a choice at No. 1,'' tweeted draft expert Dane Brugler of CBS Sports and nfldraftscout.com. "He's having a monster morning,'' NFL Network's Rich Eisen said during the broadcast. Browns defensive coordinator Gregg Williams, who was Jevon Kearse's first defensive coordinator in 1999, loves Garrett, a league source said. Kearse, the Titans first-round pick that year, earned AP NFL Rookie of the Year honors in 1999 with 14.5 sacks In his first three years with the Titans, he had 36 sacks. The Titans also went from 8-8 in 1998 to 13-3 and a Super Bowl berth in 1999. They also went 13-3 in 2000. Garrett certainly displayed that on Sunday in Indianapolis at Lucas Oil Stadium. With Browns coach Hue Jackson looking on, Garrett demonstrated incredible speed, strength and agility. He blazed a 4.64 in the 40-yard dash, tied for the fifth fastest time in Combine history by a 270-pound defensive lineman. Browns defensive end Emmanuel Ogbah is third on that list at 4.63. Ogbah, the Browns second-round pick last year (No. 32 overall) had a solid rookie season for the Browns leading the team with 5.5 sacks. And Garrett told NFL Network's Kim Jones he wasn't happy with the his time. He also dazzled scouts and coaches with his 41'' vertical leap. It was the first time a 270-pound defensive lineman recorded a vertical leap of 40 or more inches since Mario Williams in 2006. Williams, picked No. 1 by the Texas in 2006, recorded 30.5 sacks in his first three seasons for the Texas and went on to become a four-time Pro Bowler and three-time first team All-Pro. Garrett also finished second among NFL defensive linemen by bench-pressing 225 pounds 33 times. The highest was Auburn's Cal Lawson at 35. Garrett (6-4, 272) also turned in a 10' 8'' broad jump. Garrett is one of the players the Browns have been strongly considering with the No. 1 overall pick. The others are quarterbacks Mitch Trubisky and Deshaun Watson, and Alabama pass-rusher Jonathan Allen, who ran the 40 in 5.00 and bench-pressed 21 times because of arthritic shoulders. Jackson said at the Senior Bowl that a good quarterback trumps an elite non-QB in the draft, but Garrett will likely be too much of a no-brainer to take the risk. The Browns can also trade back up in the round to grab one of the top quarterbacks, or hope that one is available at No. 12. The Browns can also knock it out of the park on both sides of the ball if they draft Garrett at No. 1 and then land Jimmy Garoppolo with the No. 12 pick. The Browns obviously need a quarterback, but probably won't be able to pass on the consensus best player in the draft. In addition to the stellar workout, Garrett shined in his podium interview, and apologized to the Browns in his interview with them Saturday night for jokingly asking the Cowboys to trade up and draft him. What did he tell plan to tell them? As for turning around the losing program, he's up to the challenge. "No, I mean everybody has their down years and at anytime can be turned around," Garrett said. "The Cowboys, they turned around their season in a big way, and anybody can do that." Garrett lived up to what he planned to do on Sunday. "I feel like I'm the best player in the draft and I feel like I'll prove that today and tomorrow,'' he said. And then he went out and did just that. INDIANAPOLIS — Resisting the urge to overreact to NFL scouting combine numbers is an exercise in restraint, but sometimes it’s just futile. Case in point: Myles Garrett. The Texas A&M pass rusher entered Indy as the presumed favorite to be picked first by the Cleveland Browns, and he will leave town likely even more entrenched in that position. The only thing that might change this is if the Browns — these are the Browns, yes — were to trade the pick. And yes, they’re fielding offers for No. 1, but it might take even more to get it now. Garrett’s workout Sunday was sensational. Weighing in at a shade under 6-foot-4 and 273 pounds, he ran a scalding 4.64 40-yard dash, good for fifth-best among the DL/LB group. For comparison, there were five wide receivers who ran slower 40 times than Garrett did. His second attempt was a tenth of a second slower, but no one is complaining. Straight-line speed is overrated perhaps, as Garrett might never run 40 yards in a line on a football field again. But his other athletic numbers — a 41-inch vertical jump and a 128-inch broad jump — were terrific. His vertical jump tied for 10th-best among the LB-DL group since 2006, and his broad placed him in the top 16 in that group over the past dozen years. In addition, he racked out 33 reps on the bench press, which tied for second in the same group on Sunday behind Auburn’s Carl Lawson at 35. The feat is even more impressive when you consider Garrett’s freakishly long arms at 35 1/4 inches. Sure, the tape is what matters. Some have nitpicked Garrett’s sack production against SEC competition, and he lost head-to-head battles against Laremy Tunsil in 2015 and Cam Robinson in 2016. Garrett also hasn’t exactly thrown bouquets at Cleveland through the process so far. But he’s the best prospect in the draft, and it would be extremely risky for the Browns to pass on a potential game wrecker at No. 1 at this point. If the Browns don’t overthink it, they could have a Joey Bosa-like impact defender on the field to help upgrade one of the statistically worst units in the league last season. INDIANAPOLIS -- Picking Myles Garrett could buy an NFL coach and/or GM more time in their respective positions. That's the opinion of one NFL executive after watching the Texas A&M defensive end put on a show at the NFL Scouting Combine on Sunday. When NFL Network's Mike Silver asked the exec how Garrett looked in drills, he told Silver "like a job saver." Garrett is the heavy favorite to go No. 1 overall to the Browns in the draft, and, clearly, the buzz about him is only building after his workout in Indy. The exec is not a member of the Browns' front office, per Silver, and we don't know if the exec meant to imply that the Browns' decision-makers, just one season into their tenure, have jobs that are in need of saving. Either way, it's more high praise for Garrett on a day where there's, rightfully, been plenty of it. It will be a while before we know if Garrett is so good that he can change the direction of a franchise, but on Sunday, he looked like he had that kind of potential. 0 Response to "Myles Garrett making the Browns' choice at No. 1 easy with stunning Combine workout"